It’s a simple question. Four Richmond, Virginia, moms faced it last March, when they learned that Fred Phelps‘ roadshow of hate—the anti-gay, anti-Jew, anti-America, proto-nihilist Westboro Baptist Church—was headed to their town. The abusive Westies, who are famous for celebrating the funerals of fallen soldiers and intimidating grade schoolers, planned to bring their multi-colored signs and cuss-laden chants to four area sites: the Virginia Holocaust museum, the local Jewish Community Center, a Jewish day camp called the Jerusalem Connection, and the Straight-Gay Student Alliance at Hermitage High School. How to resist such a movement? Counter-protests? Sure. Just make sure the anger and violence is all on their side, not yours. Singing? OK, it’s worked before. Blocking their access? Lord, no. The church “elders” are all attorneys, who live to sue and counter-sue everyone who challenges them, citing their First Amendment rights. Anyway, all of these are ephemeral responses. The Westies come, 11-year-old hate-spewing child in tow, they say their piece, they get TV coverage, then they move on and do it again. A counter-protest is for one day. Westboro’s hate goes on forever. So Sarah Allen-Short, Jessica Lucia, Sara Heifetz, and Patience Salgado decided to do more. 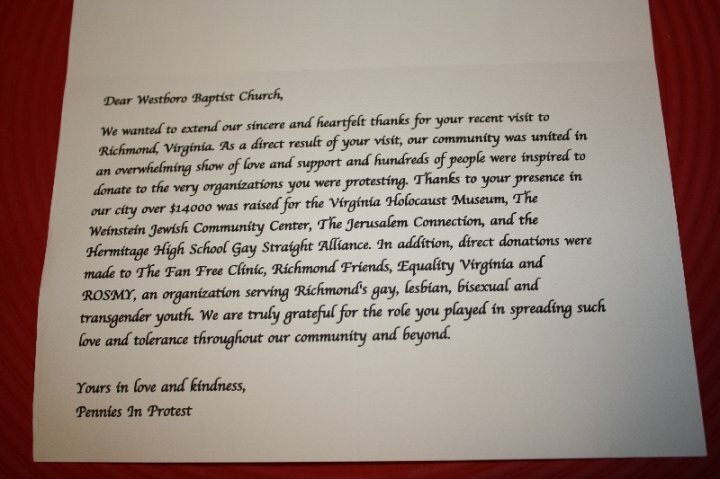 They harnessed Richmond residents’ anti-Westboro frustrations to solicit donations for the targeted Jewish and LGBT organizations. The deal: Give a dollar for every minute WBC protests. That was how Pennies in Protest started. They figured they’d get $1,000 or so. But by the time WBC blew out of town, 500 individuals had given more than $14,000. Their Facebook page had 3,000 fans. And people across the country were asking how to do it in their own communities. Oh yeah, and WBC got drowned out by counter-protesters at every stop, too. And GayRVA, the local LGBT publication, made the four women their “Out.Spoken” Richmonders of the year. Now, these ladies can’t drop their lives to follow WBC’s hate-speech caravan all over the globe. So they did the next best thing: They started a website, PenniesinProtest.com, that explains their success story and how it can be duplicated by anyone anywhere. Fourteen easy steps show how to start a charity for kindness against hate.